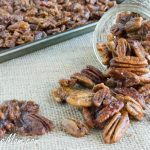 These Sweet and Crunchy Candied Pecans are low carb, sugar free and the perfect Holiday Party Snack or Homemade Gift! When I think of the holidays and all the business that comes with it, I have to be honest, it makes me cringe. It’s not that I don’t like the holidays it’s the leading up and prepping work that needs to be done for them. Being the momma most of the load goes on me for Christmas shopping and the food we shall eat on Christmas day. 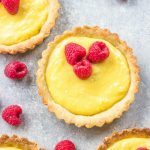 Now I love to cook and bake, but between having a blog and working with brands that need recipes on certain dates, I’m sort of on max overload at the moment. I haven’t even thought about wrapping yet! Thankfully my hubby loves to wrap and has taken over that job for me since actually I was pregnant with our youngest 11 years ago. I gave birth to him 3 days after Christmas and could not even sit comfortably, let alone wrap presents. He’s continued to wrap every since, bless his heart! BUT I still need to wrap His gifts! I’m really not a last minute shopper, I do a bunch of shopping online with Amazon Prime lol! That certainly helps, but planning the food for Christmas day, testing recipes I need for the new year ahead is what is on my mind. I actually think I put the stress on myself to be honest. I get excited knowing we have a party to go to so I can honestly try out new recipes on everyone! Saturday night we had a party with friends from church so I made 2 new recipes, one in the crock pot and another as an appetizer for New Years. Both scored big points with everyone so I will most certainly be sharing them soon! I can’t help myself especially when I know there’s a crowd. It’s exciting. So even on Christmas Day I will be making a brand new never made before recipe, oh my, yes on Christmas day when my parents and brother and sister in law will be coming over for dinner. No wait a minute, scratch that, not one new recipe but two!!! I pray they won’t fail. But being an Italian you can bet I have plenty other tried and true recipes to give them. 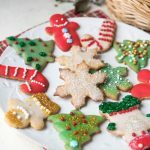 At least the new recipes I’ve chosen to try on Christmas are not desserts, because that would be too risky since sugar free desserts take me many tests before perfection and sharing on the blog. 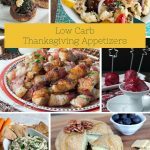 In Christmas’s Past, we’ve enjoyed these recipes: Zucchini Lasagna, Spaghetti Squash Lasagna, Brussel Sprout Salad, Asapargus Bundles, and of course plenty of desserts! Some of the favorites are my Grandmother’s Butterballs, Peppermint Brownie Bark, And my Favorite of all, Peppermint Cheesecake Pie! WHEW!! I’m exhausted thinking about it all! 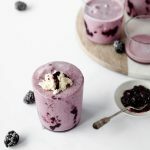 But this recipe today is one I can make over and over again with no stress, no worries and honestly hassle free! 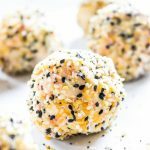 It’s perfect for gift giving as well as a holiday party snack! If you don’t have Sukrin fiber syrup, you can use another sugar-free honey or maple syrup of even molasses if you’re not sugar free. Bourbon is optional and can be eliminated if desired. 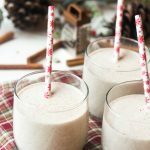 The photos in this post are a double batch of the recipe below as I plan to give them as gifts in mason jars to family and friends for Christmas. I used Swerve Confectioners sweetener but you can use any granulated sugar free sweetener you like. This recipe was first published in December of 2014. Whisk the butter and syrup until combined. Add the bourbon (optional) and maple extract and stir until incorporated. Stir in the Swerve and cinnamon. 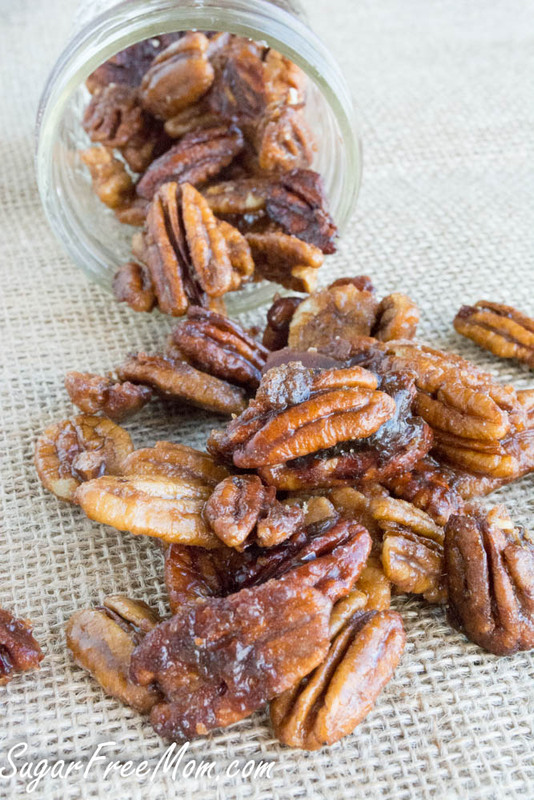 Place pecans in a bowl and toss together with coating. Spread them on a greased baking sheet and bake 15 minutes. Once out of the oven while the juices on the pan are still hot, use a spatula to toss the pecans and then allow to cool before storing in an airtight container. Wowers! These look tempting! I can see popping them straight into my mouth or incorporating them into other desserts. What can I use in place of the molasses? Can I make them without it? How do you feel about the reviews that say that sukrin is high glycemic when blood sugar is tested after ingesting and that sukrin being a foreign company is untouchable when it comes to any recourse for the false advertising? Could these reviews saying it isn’t sugar free have validity? Personally, I have never tried the syrup or sweetener, but I am now leery because I did order a gluten free cake mix from sukrin’s website and ran it thru an at home gluten free test kit and it came back positive for gluten. Do you still feel comfortable feeding this product to your family? I’m the one with a gluten sensitivity, but I am not celiac and no one in my family is so I’m comfortable with that. As far as spiking ones blood sugar I have not had that happen to myself, but everyone is different and certainly should check their blood sugar if trying this product for the first time. There is so much to prepare for Christmas. I know exactly what you mean! Luckily the last couple of years, my daughter has volunteered to wrap gifts! This would be a perfect gift idea!! Yes, for spiced nuts. My husband would absolutely love these. It’s always risky to try something new on a holiday with company over! I’m doing it, too! Hoping for the best. 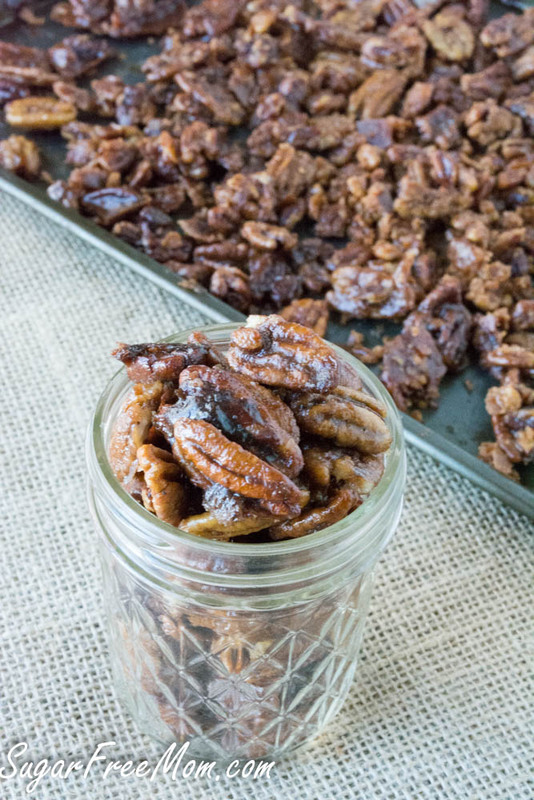 Love the candied pecans! I’m doing candied almonds for tomorrow. These nuts look amazing! I want to sprinkle them all over a giant bowl of ice cream…yum! Bourbon. You had me at bourbon. These look fantastic. I just made some spiced nuts as gifts and I really wish I could go back in time and add bourbon! 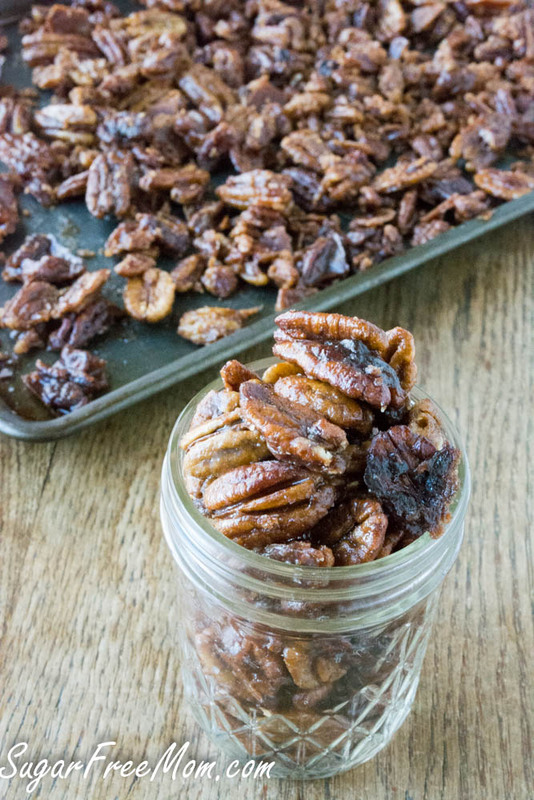 I love spiced nuts – and with bourbon added – even better! Merry Christmas Brenda! Yes that would work too. THose would be amazing for my homemade pecan pie! I made these today and they burnt!! Are you sure that the oven should be 350 degrees or should it be for 250 degrees? I cooked them the specified amount of time and like I said they were burnt. Most of them tasted OK, but a lot of the burnt ones stuck to the pan. This recipe states it is sugar free. 1 tbls of molassas contains 15 grams of sugar. So how can it be sugar free.? 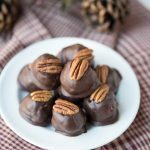 I am looking to make coated pecans using xylitol. One serving does not contain 1 tbsp of molasses. Divided by the amount of serving 1 tbsp is minuscule to the serving. 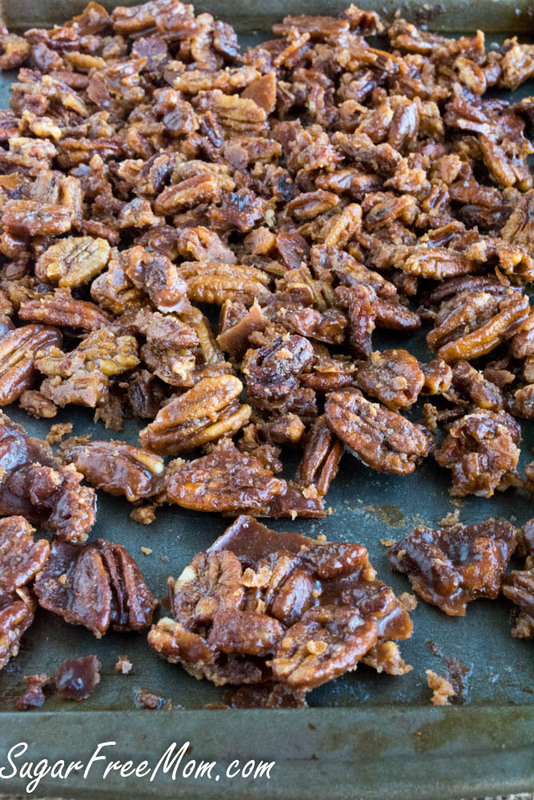 I made these pecan treasures and cooked them at 325. I only had Xylitol so used that. They are excellent. I took them as a hostess gift and we all loved them. It seems the link to the Sukrin syrup says this product is not available. Can you suggest another sugar-free alternative? I edited the recipe to use Lakanto sugar free maple syrup. It would be really hard for me to stop snacking on these once I started. They sound amazing! I’m a diabetic so I can’t use black strap molasses, can I sub Brown Sugar Splanda Blend instead? I’m not sure as I haven’t tried it since I don’t use Splenda. Brown Sugar version of Splenda is almost half pure sugar. Look at your bag! This is brilliant. Can see using rum, amaretto, whiskey, other liqueurs as well although sugar content higher from those? 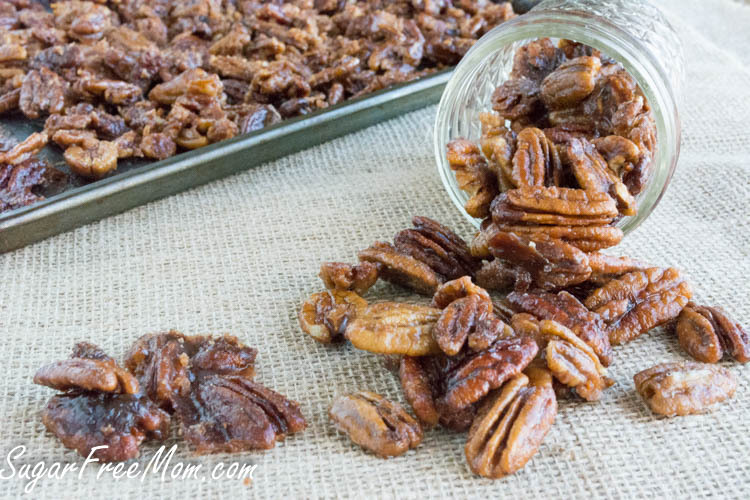 I’ve had great success with sugar free roasted cinnamon pecans. Non-diabetic friends/family gobble them up so I’m excited to try these. 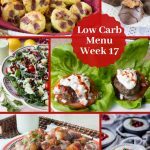 Thank you for sharing your recipes which are very well thought out. Thanks! I think another liqueur would also work. I made these this morning using Amaretto and additional spices for my Mom. They are yummy and I know she will LOVE them. Thanks for posting this recipe. I have seen it before and meant to make them, but didn’t. I saw them on Keto Adapted’s post and decided to make them! I love these! Making them again now to take on vacation, using jack Daniels. So good. These are awesome! Reminds me of pralines, without all the work. I used Jack Daniels & Sukrin syrup, as it was what I had on hand. Beautiful! I so need to make these. I have 40 lbs of Texas pecan halves in my freezer in Foodsaver bags. I sort of got a little greedy picking them this year …. How long do these keep? Planning on getting small mason jars for gifts but also snacks for me. You could store in the refrigerator at least 1 month. I have some log cabin sugar free maple syrup would that work in place of one of the liquid syrups ? Really good and easy! We have made multiple times skready. Thanks. I just took mine out of the oven and it is great! instead of bourbon i use Bailey and it tastes OK. And I just used whatever sweetener I have in the house and it still taste great! thank you so much for give us such a good treat! My husband is in love with it. Do you prefer the gold or clear Sukrin syrup? Thank you for the recipe! Made them last night, and they were very yummy! I used Jack Daniels, since I didn’t have any bourbon, and also used Walden Farms syrup, since that’s what I had on hand. My hubby put them on his blue cheese wedge salad and declared it “tasty”! He’s super picky when it comes to non sugar sweeteners, so I’m glad he enjoyed these! I guess that means I’ll have to share them with him, LOL! How much maple extract ? Sorry I used 1 tsp. Thanks for letting me know, all updated now. Is butter necessary to make them ‘set’? Could oil be used, olive, canola, corn, etc.? 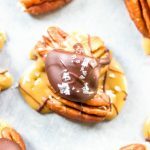 I’ve found this to be THE best keto candied nut recipe. 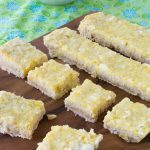 I use mapleine instead of bourbon, and they are to die for! I’m not sure since I’ve not tested it with anything else but I think the butter could be swapped with coconut oil.